It does not seem the official announcement about the iOS wallpaper. These statements are based on my observations and experiment. iOS10 Home Screen has a lot of changes. First, the background is darkened using any wallpaper! iOS 7.1 again!? The 2nd dark age comes! The background was not darkened with black (colored) letters using pale color or enough dark low contrast wallpapers. 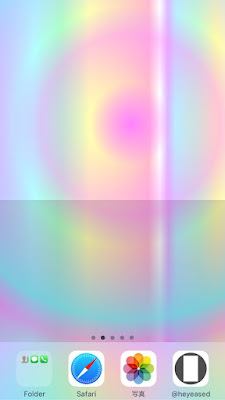 It was same using "quite" small images (letters are white.). iOS 8.3 or later, the size is related with brightness for some reasons. With white letters using dark, vivid, small wallpapers, the background was darkened. The top was darker. Lock Screen was the same as Home Screen. The background is always darkened. There are two stages in depend on the wallpaper. Weak Dark Filter: The letters are black (colored). The background is a little darker than original. If the wallpaper is enough dark, the letters are white. Lock Screen Doesn't turn dark. Strong Dark Filter: The letters are white. The background darker than Weak Dark Filter, dark at top. It shows using high contrast/middle brightness wallpaper same before iOS 10 but darker than 9.3. Lock Screen turns dark, but more blight than Home Screen. Lock Screen background is same as iOS 9.3. The thresholds of black/white letters seem to the same as 9.3. But if due to small size, it became more complicated. I think iOS 10 is added contrast measurement at so dark or small wallpaper. It had been omitted until 9.3? 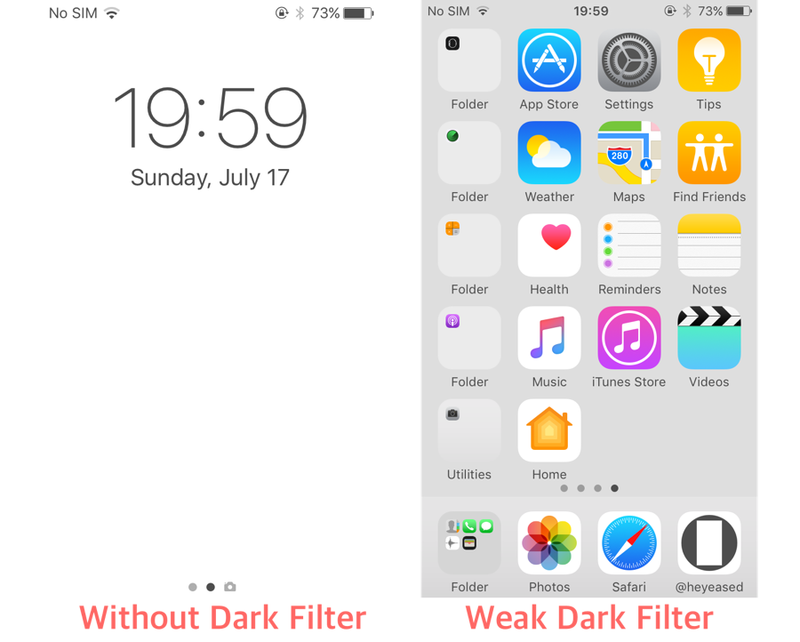 Also Dock is a little darker than iOS 9.3. 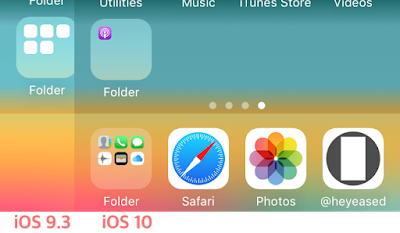 When the folder opened, Home Screen is blurred keeping icons layout. The opened folder is whitish using any wallpaper. The magnifying glass icon is obsolete. The page 0 (Spotlight and widget) is denoted by the dot. The default wallpapers lineup is simple. Some of past iOS wallpapers have been revived. 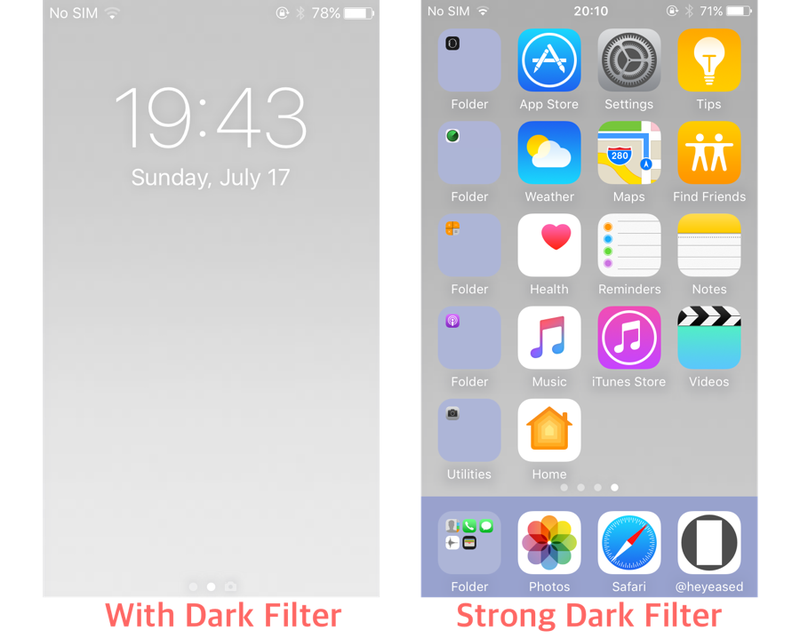 With "Reduce Transparency", the color of Dock and folders is changed light gray. The blur effect is stronger than iOS 9 using small wallpaper in depending on the devices. 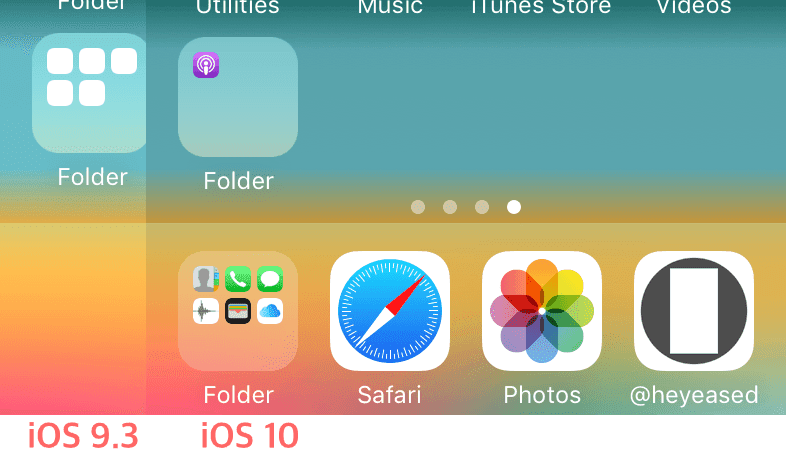 Dock and folders pick up the background color on 1px width wallpaper. 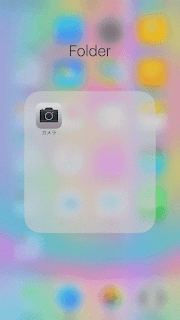 The image size to make rounded folders became more unstable or complex. 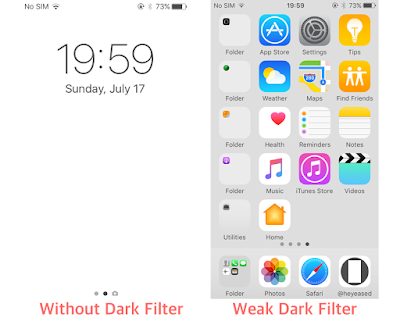 If Home Screen and Lock Screen display the same, sometimes Home Screen wallpaper is changed to Look Screen one (Lock Screen takes priority. ), even these have different size or margins for Parallax Effect. It was triggered by only white. Many wallpapers on my site don't work no longer. But I have a lot of new!